Resistance: Burning Skies really does feel like a console-style first-person shooter despite its handheld nature, allowing one of Sony's pre-release promises to ring true. However, it lacks a standout feature, employing familiar genre designs. Before the PlayStation Vita came along, portable gaming systems struggled to emulate the type of fluid first and third-person shooter experiences that their console peers were known for. The main reason for this noted market deficiency was the devices’ absence of a second control stick. This meant that console gamers, who were used to using controllers with two joysticks and familiar control schemes, were being asked to deal with only one stick and the clunky face-button camera controls that design choice brought with it. Not surprisingly, many users voiced their complaints, stating their hope that the next round of handheld gaming tech would fix such a glaring issue and, thankfully, Sony listened. While the high-tech phenomenon’s February launch line-up lacked the first-person shooter touch, that wrong has been made right now that Resistance: Burning Skies has hit store shelves. Promising a bullet-spewing experience like that of its television-requiring peers, the latest iteration in the popular first-party franchise has been on many users’ watch lists since its announcement. Though, now that it’s available for purchase, how does the Vita’s first full first-person shooter live up to its promises and their resulting hype? Pretty well, actually. In Resistance: Burning Skies, players take control of Tom Riley, an everyday hero who works for the New York Fire Department. It’s the year 1951 and, after invading other parts of the globe, aliens have made their way to the good ol’ United States of America. With taking over one of humanity’s most successful refuges on their collective minds, the Chimeran baddies rush to the offensive by decimating the city and capturing its citizens. Their plan? Those familiar with the franchise will know this one well, as the ugly beasts hope to turn our kind into their own, through the use of disturbing conversion centres. After responding to an emergency call resulting from the invasion, our newly-assumed hero helps his family flee the wreckage, with the hope that they’ll be safe in one of the government’s erected camps. Though, since he’s unable to neglect his civic duty, Mr. Riley ends up staying behind, in an attempt to help those still in danger. That choice ends up leading to much more than he ever expected, with fear regarding his family’s safety ever-present within his racing mind. Thus creates a rather basic storyline that we’ve seen this franchise employ in the past, pitting one man against the horde in an attempt to save his loved ones. If you’ve played one of the previous three Resistance games, then you’ll have a pretty good idea of what to expect from this release. Mixing rather old-school run-and-gun gameplay with a clunky cover system, Burning Skies focuses less on carefully-planned tactics than it does on using visceral weapons to quickly take out rooms full of monsters. What’s created is a rush-filled go big or go home mentality, which is reminiscent of games that many of us grew up playing. Of course, those titles didn’t have a regenerative health system, touch-screen controls or cover mechanics. Played out over the course of six rather lengthy missions, this title’s five hour-long campaign is one that grabs you from the start and doesn’t let up until its (rather lame) final boss encounter. That’s both a positive and a negative because, while it means there’s a lack of needless backtracking and dull interludes, there isn’t a lot of depth to be found in the experience. What you see is really what you get – a game where you do little more than shoot (badass) guns and throw a lot of grenades. Sure, that’s what a lot of us flock to this genre for, but a lot of today’s titles tend to have some sort of depth or variety added in. Burning Skies pretty much stays the same from start to finish, employing a design that is fun, but happens to lose its excitement due to repetition. It’s only real addition is a unique upgrade system, which uses advanced technology to give weapons special attributes. In order to survive the onslaught of Chimera both big and small, players must make sure to hide behind obstacles whenever the going gets tough. The screen will flash red indicating health-based danger, and crouching while moving toward a blockade or column will let the game know you want to wait for your imaginary wounds to heal. Being out of sight allows you to pop upwards or sideways, in order to fire a couple of shots off before moving back to safety. It’s a system that most gamers have seen a lot of, but Nihilistic Software has created a version that lacks fluidity, occasionally leaving you open to attacks while thinking that you’re hidden. When enemies flank on either side, it’s understandable, but not when they shoot from above and you’re an inch or so away from a concrete barrier. 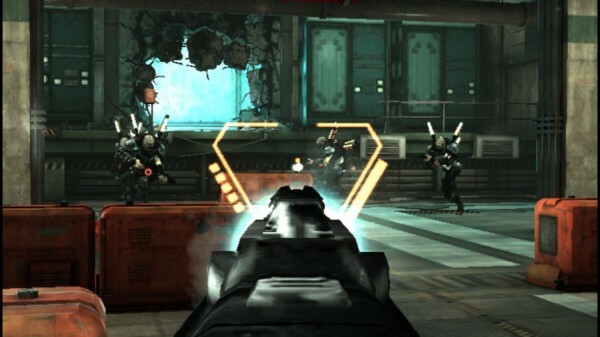 Although touch controls do not play into the game’s cover mechanics, they are featured heavily within its core gameplay designs. Touching circular icons with human hands inside of them allows Tom Riley to open unlocked doorways or pick up story-related correspondence. Continuing this trend, touching an axe icon instigates visceral one-hit kills, while finger swipes can be used to throw grenades, highlight enemies, load weapons or send out a secondary fire attack. It’s all implemented well, without any major issues, and the same can be said about having to tap the rear touch-pad to run. However, there are a couple minor problems to highlight, including how missing the exact spot where a hand icon is positioned will lead to the character throwing a grenade close to his position, and the speed at which one must attempt to control a quick-fire attack drone’s trajectory. The latter special attack ends up being hard to use as a result. On top of a rather robust single player mode, which truly does emulate the console experience well, Resistance: Burning Skies features an eight-player online multiplayer option consisting of three separate modes: Deathmatch, Team Deathmatch and Survivor. Like its first two modes, this competitive arena is rather basic and uninspired, with its only secondary scenario being one where a team of Chimeran players attempts to kill and turn an opposing team of humans. Of course, that description is quite similar to that of the other two modes, except respawns aren’t available for one side. 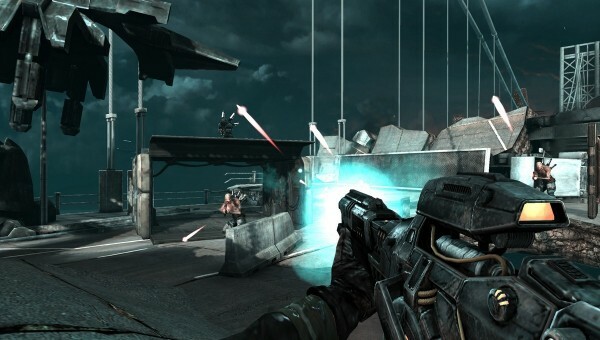 As a result, you’ll have to like kill-based objectives if you’re to find much enjoyment in this game’s online arenas, and their large or small lobby types, which allow up to eight players per match. Just before I started my review session, Burning Skies received an update. The reason for such a quick fix? Connection issues. Gamers were unable to get into competitive online games, receiving failure messages related to server errors. I’m happy to report that the patch did its job for the most part, though its servers are still experiencing odd problems. I encountered a connection issue, as well as a body bag competition where the score tally decided it would prefer to remain at zeroes across the board. Hopefully Nihilistic Software will be able to fix those glitches, in order to present the error-free multiplayer experience that they had hoped to create. Granted, even then, its average qualities and uninspired designs will limit its repeat appeal. That factor is also limited due to a lack of online trophies, as only one made the list, with all of the other incredibly easy profile awards being associated with the game’s core solo campaign. When it comes to presentation, this handheld venture doesn’t lack impressive aspects. It looks quite good, has boisterous audio, and delivers fast-paced action with a lack of noticeable frame rate hiccups. That is, other than occasional ones found during online play, where the general look of the game also take a bit of a hit. Sure, it doesn’t stack up to the console elite, but that’s not something one should expect from a handheld release such as this. As a result, those who go in with realistic expectations should find themselves impressed by its campy, bullet and explosion-filled visuals. 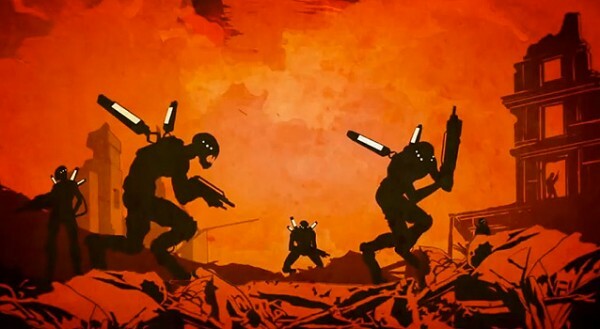 That action-packed B-movie motif is carried over into several included cutscenes, which use both 1950s survival videos and colourful motion comics, in an attempt to further showcase a world in chaos. On the downside, this game is not a stranger to pop-in, whether it’s with regards to enemies or textures. You’ll notice the odd environmental texture map joining the party a bit late, but it’s much more noticeable when the enemies do so. There were times where I’d walk into a seemingly desolate area, and would be greeted by enemies who’d appear within it through out of thin air means. Also, on more than one occasion, enemies simply disappeared. Both of those visual glitches lessened the game’s immersion, although my hope is that they can be patched. Thankfully, those things should be able to be altered through that method, although there’s no way that Nihilistic will be able to patch the game’s other odd problem: an ally named Ellie who is seemingly able to teleport from one spot to another. She will unexpectedly beat players to most objectives, despite spending most of the game as a follower positioned behind Tom. 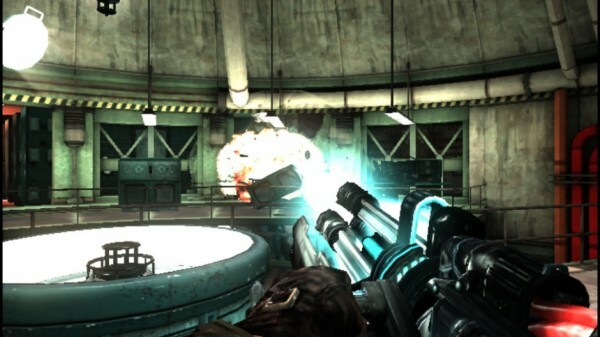 In the end, Resistance: Burning Skies is a relatively fun arcade-style shooter, which offers fans of the first-person shooter genre a portable experience that emulates its console counterparts well. Varied guns, visceral melee kills and a fast pace are all on offer, but there’s nothing new to be found in what is a rather retro-feeling release. Still, one must remember that this the studio’s first crack at developing a first-person shooter for Sony‘s relatively new handheld, making it easier to overlook some of its rather basic design choices.